Food and Restaurant News for Calaveras & Western Alpine Counties. Twain Harte, CA...Join the Twain Harte Area Chamber for their first Memorial Day Weekend Chili Cook-Off! This event will be held in Meadow Plaza in Twain Harte on Saturday, May 27, from 9 am to 3 pm with kids’ activities at the nearby park. Copperopolis, CA...Gold Dust Pizza is bringing their delicious pizza to Copperopolis Town Square! Piled high with toppings on a thick crust, their pizza is sure to satisfy any craving. Just try their special Gold Digger pizza, which comes topped with salami, pepperoni, mushrooms, black olives and sausage. When can you get some? Gold Dust Pizza plans to be open by May 6th, just in time for the Hot Copper Car show. We will keep you updated on their progress! San Andreas,CA...Curious about canning your own food at home but have never tried before? Learn to can food and stock your pantry with shelf-stable jars of food with ingredients you can pronounce, see and enjoy all year long. This free class introduces boiling water and atmospheric steam canning as safe methods to preserve fruits, sauces, salsas, pickles and other tasty treats. Learn the most recent research-based canning techniques for high acid foods. Tuolumne City, CA... Black Oak Casino Resort is the luckiest place to be this St. Patrick’s Day. Beyond the hottest gaming and entertainment action in the Sierra Nevada Foothills, the property will offer an array of holiday inspired dinning specials on March 17. Rail Road Flat, CA...The Rail Road Flat Community Club is hosting The Seventh Annual Crab Feed on Saturday, March Fourth. The crab feed will be held at The Rail Road Flat Community Hall located at 250 Rail Road Flat Road. Proceeds to support the RRF Community Hall. Angels Camp,CA...It's the 2017 Annual Crab Feed hosted by The Angels-Murphys-Arnold Booster Club on February 11th in Mark Twain Hall at the Calaveras Fairgrounds. Proceeds to benefit youth sports provided by A.M.A. Angels Food & Sierra Hills Markets Weekly Ad Through February 7th! Shop Local For The Super Bowl! 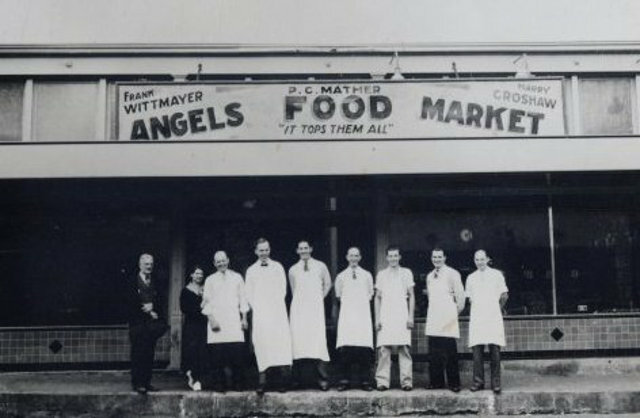 Angels Camp & Murphys, CA...Sierra Hills, Angels Food & Sierra Hills Natural Food Markets have been part of the Calaveras community since 1935. High Quality, Great Customer Service and Great Hometown Prices. "We are dedicated to providing the best to our customers. " - Mike Croshaw Wishing you Good Times & Good Cheer. Sierra Hills Market 209-728-3402 Angels Food Market 209-736-4243 We have everything you need to create the perfect Super Bowl Party! Murphys, CA...Join us on Tuesday, January 31st, any time between 4:30 and 7:30, for the last of our annual Tuesday Night Beer Dinners in January. We offer an optional 4-course beer and food pairing menu, but our full regular menu is also available. 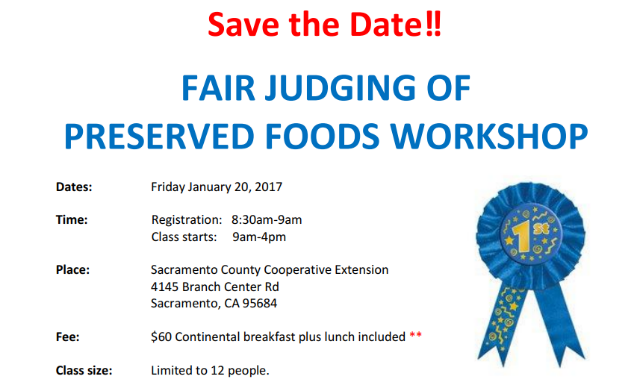 Sacramento, CA...In this all day workshop you will learn the guidelines to judging preserved foods at fairs and other competitive events. The rules used at our California State Fair will be presented and discussed. There will also be a lab where you will actually participate in judging preserved foods with our instructors nearby to help guide you and answer your questions. An understanding of the principals of preserving high acid and low acid foods is recommended for this workshop.